It was interesting for me to observe how the new and free app, FajrUp, seemed to create a similar experience for the users. 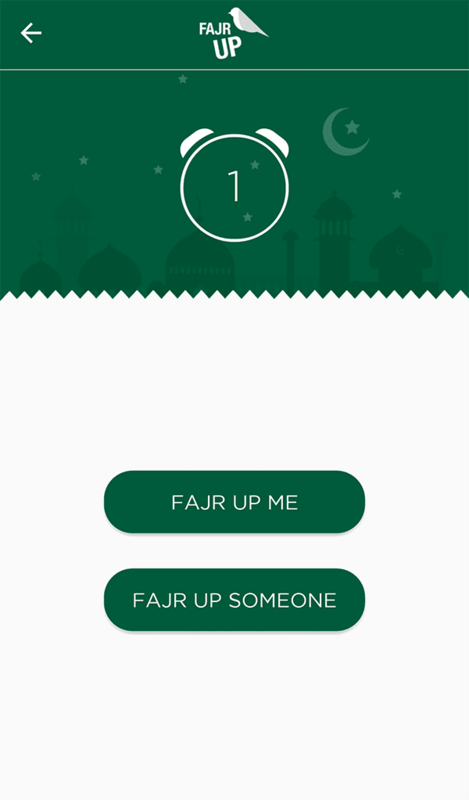 We snooze or dismiss alarms we set to wake up for fajr, but what’s interesting about this app is that you’re not relying on an alarm; you will actually be receiving a phone call from someone to wake you up! Imagine getting a phone call from someone saying, “as-salatu khairon min al-nawm“! Seems even more alarming, right? In FajrUp it will not always be ‘as-salatu khairon min al-nawm‘; it can be an ‘assalamualikum’ followed by an ayah from the Qur’an or a greeting in a language you have never heard before. In any case, a phone call from an unknown person normally provides enough mental engagement to overcome sleep inertia. More than that, what I like about this app is that it opens an opportunity for me to anonymously help someone fulfill their ibadah and we know that “Allah is helping the servant as long as the servant is helping his brother” [At-Tirmidhi]. When you use FajrUp to wake someone up or request someone to wake you up, you are called a FajrUpie. 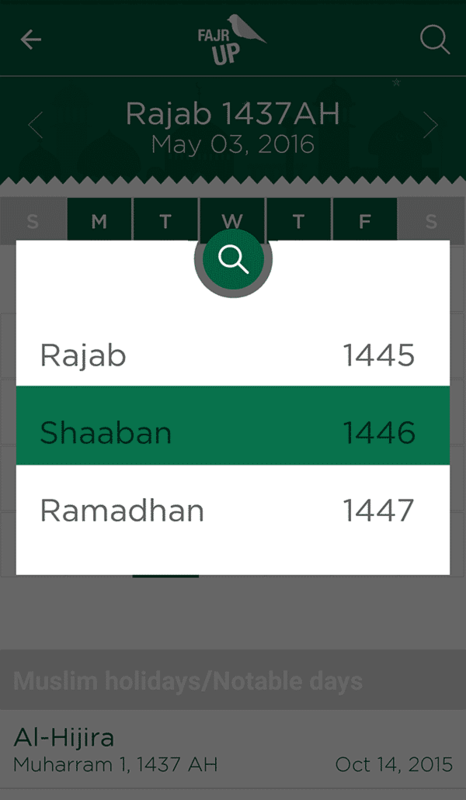 The total number of FajrUpies available to be woken up is shown above the fajr-up options and the list puts on view the most immediate available FajrUpies at the top, highlighted in green. On this note, I really liked its user-friendly design! Is it safe making a call to an unknown person? FajrUp is gender specific and makes sure that users cannot make a call to or receive a call from a person of the opposite gender. The developer seems heedful of observing modesty, privacy and respect for all FajrUpies. Also, the call lasts only for 15 seconds, just enough to relieve you from the inertia of sleep. These calls are made via VoIP (Voice over Internet Protocol), an IP-enabled service which allows you to make voice calls using a broadband internet connection. So the user’s phone must be connected to an active network so as to access ‘Reminder’ and receive or make a call. If the user misses the call from a FajrUpie, a missed call notification will be displayed. What if you do not want to receive a call or your phone is not connected to a network? If the user does not want to receive a call, an alarm can be added for fajr and the user will be woken up by adhan. The user will also be woken up by adhan if no one is available to wake him/her up. 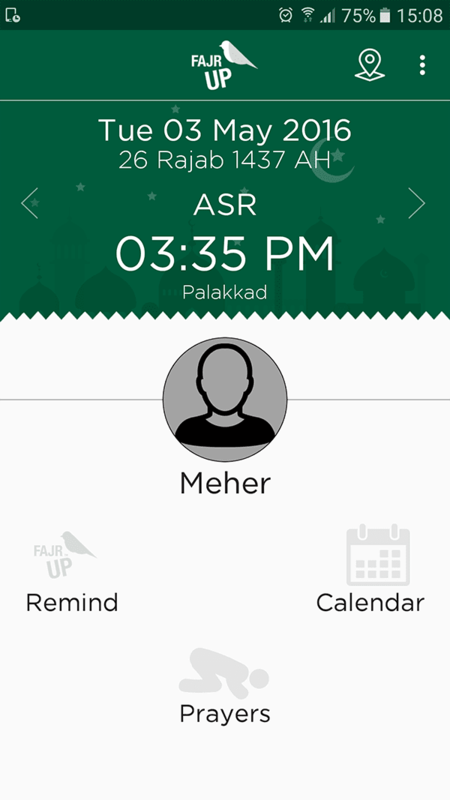 Alarm for other salahs also can be added to remind oneself to perform salah on time. 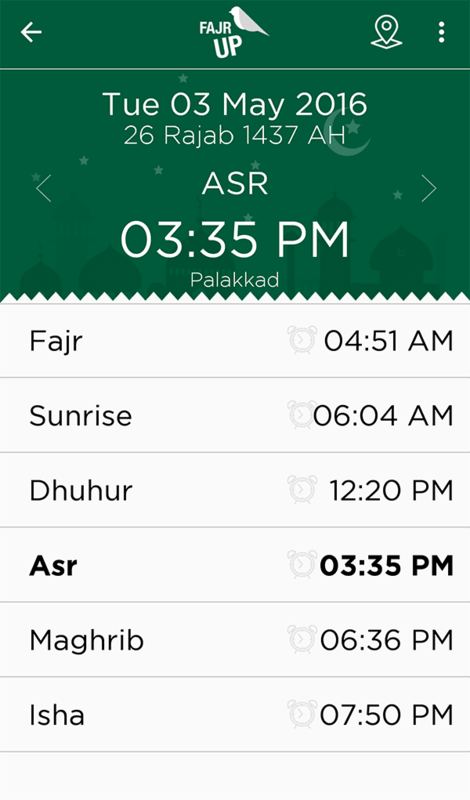 FajrUp features the prayer times according to locations via GPS and all what the user needs to do is select ‘Prayers’ and then select the desired salah to set an alarm. So, simple and short to use during a hectic schedule, also far better when compared to some built-in alarm clocks where we need to touch repeatedly to select time. A notification will be displayed for a missed alarm too. 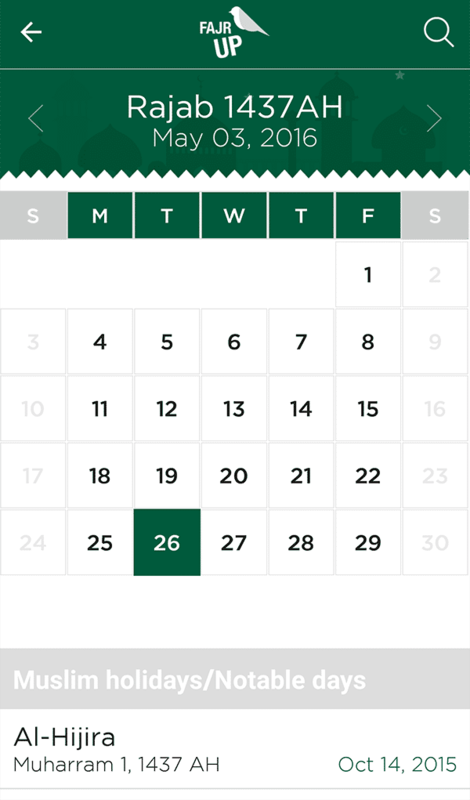 FajrUp, in its decent and calming white and green design, features a calendar highlighting Islamic holidays and other notable days. 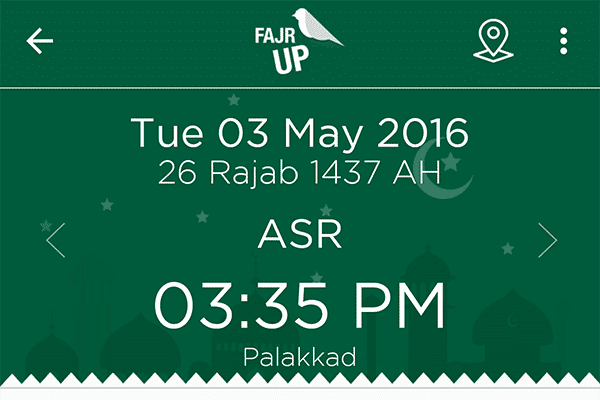 Some other apps also provide that, but FajrUp makes it easy for the user to navigate through the calendar. You can, for instance, leap to 20 years ahead in less than 3 seconds. How cool is that! Overall, pleased with this app experience! May Allah reward its team for enabling the ummah to enjoin goodness by waking someone up to perform the precious fajr salah. Have you tried this app yet? Let us know your thoughts in the comments section.